Up there with Blind Lemon Jefferson in the pantheon of 1920s blues music stands Robert Hicks, better known as Barbecue Bob, an Atlanta native that found fame in the late 1920s as one of the top “race” stars for Columbia records. Over the course of his short recording career, Hicks waxed sixty-eight sides. Born September 11, 1902 in Walnut Grove, Georgia, Robert Hicks and his brother Charlie, along with Curley Weaver, learned to play guitar from Weaver’s mother. While working as a pitmaster at an Atlanta barbecue joint, Hicks was discovered by Columbia records talent scout Dan Hornsby (who also worked as a musician and is known for his association with Gid Tanner’s Skillet Lickers.) Taking his recording name from his work, he made his first recording in March 1927, titled “Barbecue Blues”, which may have been named by the Columbia staff to fit his gimmick, as the lyrics make no reference to barbecue in any way. Hicks went on to record many more sides between then and December 1930, both solo and as part of Georgia Cotton Pickers. Robert Hicks died from tuberculosis and pneumonia on October 21, 1931. Columbia 14222-D was recorded June 15, 1927 in New York City by Barbecue Bob, accompanied by his own twelve-string guitar. The DAHR says that both takes 1 and 2 of both sides were issued, these are both first takes. These are the first two sides from Barbecue Bob’s second recording session, and his second issues record. This was probably one of the most successful country blues records of the 1920s. 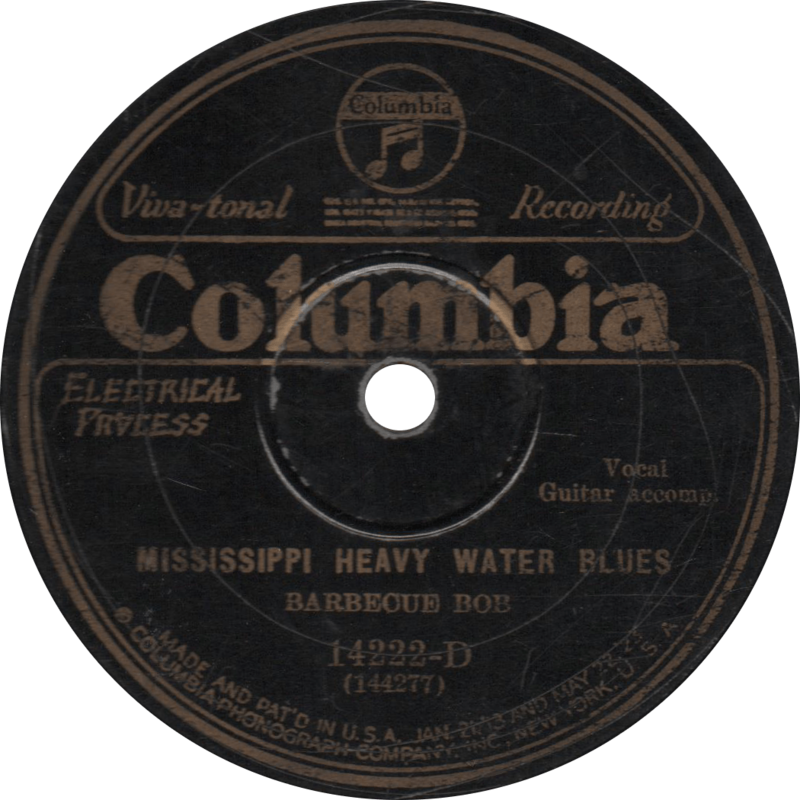 Mississippi Heavy Water Blues, recorded June 15, 1927 by Barbecue Bob. 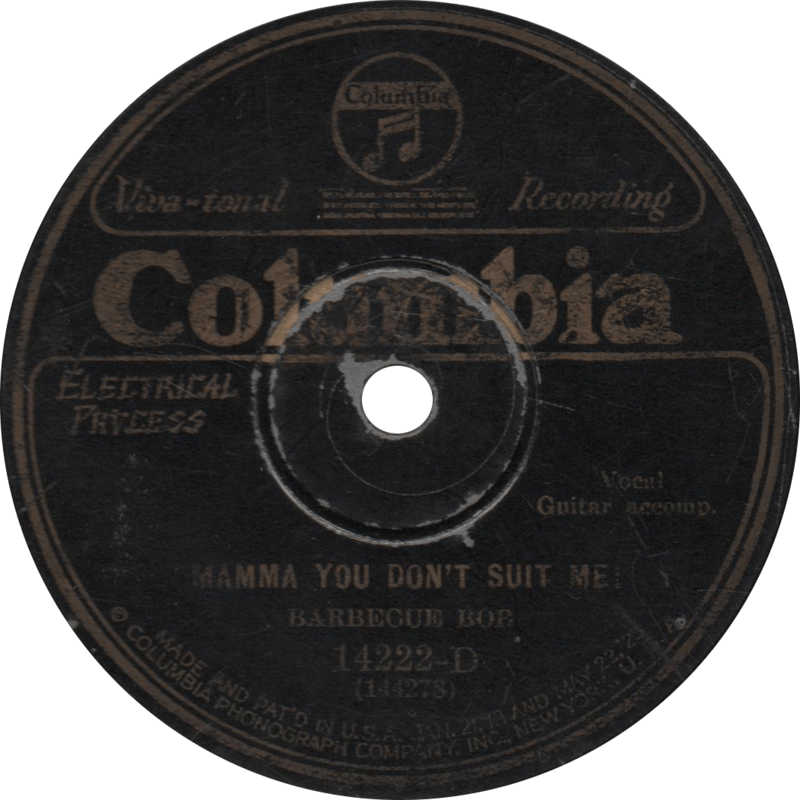 Mama You Don’t Suit Me, recorded June 15, 1927 by Barbecue Bob. Updated with improved audio on October 14, 2017. This entry was posted in Records and tagged 1920s, 1927, Atlanta, Barbecue Bob, Blues, Columbia, New York, Piedmont, Race Record, Singing with Guitar, Topical Song by R. Connor Montgomery. Bookmark the permalink.